Here’s something you don’t see everyday! 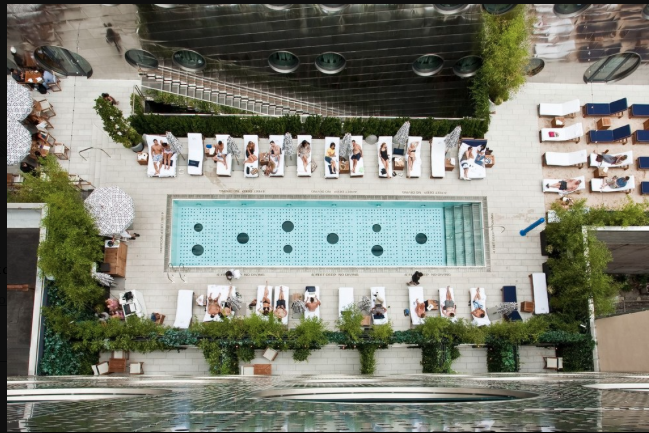 The boutique hotel chain http://www.dreamhotels.com/downtown/amenities-en.html features a glass-bottom roof-deck hotel pool, that looks down into the hotel lobby. Swimmers can go deep and see who is currently checking in, while lobby dwellers must look up to quite a view. See those circles in the image? They are glass. The website also says they have the only sand beach in Manhattan, plus loads of chaise lounges, cabanas and a DJ booth. We can’t wait to check this out next time we’re in the city. Have you been? Spill.